Ever rubbed your belly and patted your head at the same time? Well, it will make anyone look ridiculous and it won’t help you here. But the principle of doing two seemingly unrelated things at once can be just as alien and as off-putting for many would-be singer/songwriting guitarists. Don’t dismay: it’s not rocket science, and you’ll quickly improve if you follow our guide. 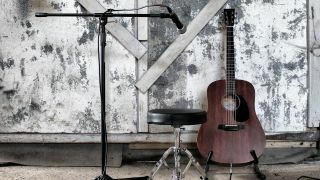 Whether you’re a guitar player or singer looking to do the other skill simultaneously for writing and performing, there are simple ways to start. It’s all about getting the guitar playing sorted so you can then focus on the singing. It sounds obvious, but plenty of people rush in without actually knowing the song well. Get familiar with the melody and inflections, and sing over the record to practise. Focus on the key guitar strumming patterns and what lyrics the chord changes occur on. Simplify strumming to begin with to get comfortable, then build up to a busier rhythm part. Write out and read the lyrics and chords in front of you, then tackle things in chunks, singing and playing them over and over. If you’re constantly looking at your strumming hand during chord changes, then you’re almost definitely not concentrating on singing and projecting your voice. Is your strumming rhythm going off? Try using a metronome to help stay in time. Be critical - your mobile phone will do for a rough recording. What you hear in your head isn’t always accurate and you’ll be able to focus on areas to improve on. Don’t give up on a song - every time you try, you’ll get better. Broaden your new multi-tasking skills and, even if you’re not into becoming a covers act, you can always break these tunes out around a campfire! If you’re building up to singing and playing your songs in a basic, chordal way, making the leap to single-note parts such as riffs and more intricate fingerpicking can feel like a significant learning curve. If it’s a fingerpicked part, it’s vital to start slow. Don’t dive in at full speed; it makes everything feel 10 times harder. Writing parts while playing and singing them as you go along is the best way to get better, because you’re working on both from the inception rather than trying to add one on to the other later. So the next time you come up with a chord progression or riff, start thinking what kind of vocal melody could compliment it as soon as possible. Start by humming and then build from there.